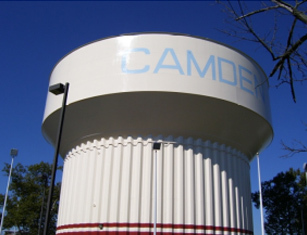 Camden City, Camden County, NJ – Over the years, CES has provided surveying, engineering design, construction management and construction inspection services to many road, bridge, sanitary sewer and water infrastructure projects for the City of Camden. 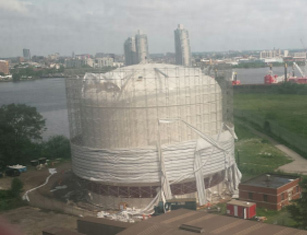 CES provided construction management services for the sand blasting and painting of the three city-owned potable water storage tanks. The storage facilities consist of two two-million gallon hydropillars and a five-million gallon ground level tank. Services included field observation of the blasting and painting activities, conducting the pre-construction meeting, review of shop drawings and contractor payment requests, issuing clarifications during construction, coordination with the client and contractor, conducting wage rate interviews, and more. The City also awarded two change orders to CES’s contract to perform engineering design and construction management services for the rehabilitation of the altitude valves at the two hydropillars and the replacement/upgrade of the city’s SCADA data collection system for both the potable water and sanitary sewer facilities.